In this box there are 504 different games! There are 9 different game modules that make 504 different games a reality! 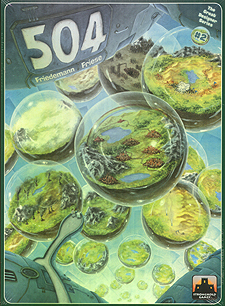 To play any of the 504 games, choose 3 of the game modules. The first module determines the winning condition, the second defines how players earn money, and the third provides the overall direction for the game. The result is a total of 9x8x7=504 completely different games! You travel across the world to deliver goods to the cities. In this world, you try to be faster than your opponents. You obtain advantages in this world by getting personal abilities. You experience a world full of conflicts, dice battles and backstabbery. You explore an unknown world tile by tile. By building a personal network of roads you connect the furthest places in this world. You always try to own more than your opponents. You produce the goods of this world. You fight as financial sharks for your personal wealth.